THOUSAND OAKS, Calif. (AP) — With an extra week to reflect on a Monday night shootout in which the Los Angeles Rams allowed 51 points and 546 yards to the Kansas City Chiefs, defensive coordinator Wade Phillips was focused on the positives. 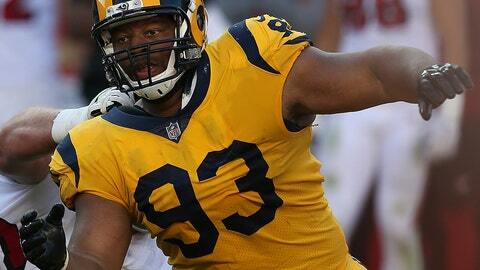 After a sterling start to the season that included six consecutive scoreless quarters and allowing Arizona to run one play in Rams’ territory in a dominant 34-0 win, Los Angeles has allowed 31 or more points in five of its past eight games. That total includes each of its past three games, but Phillips remains upbeat about the trajectory of his defense. The main source of that optimism comes from the Rams’ ability to generate takeaways against the Chiefs. The defense did not have an interception in its three previous games against Aaron Rodgers, Drew Brees and Russell Wilson, and it forced only two fumbles in those three games against Green Bay, New Orleans and Seattle, but was able to turn up the pressure against the Chiefs. Phillips was especially pleased with the interceptions by cornerback Marcus Peters and safety Lamarcus Joyner in the final minutes when the Chiefs had chances to tie or win the game. The ability to make plays in critical moments, Phillips said, has been one of the defense’s best attributes. McVay called Talib’s impending return a “big boost to our football team,” but said the exact nature of his participation would be determined later in the week. Slot corner Nickell Robey-Coleman said Talib’s presence means more than being able to play the press coverage Phillips prefers. NOTES: Defensive tackle Ethan Westbrooks participated in Thursday’s walk-through after not practicing Wednesday because of illness. With LT Andrew Whitworth and C John Sullivan were both full participants Thursday after getting a day off to rest, every player on the Rams roster was available.